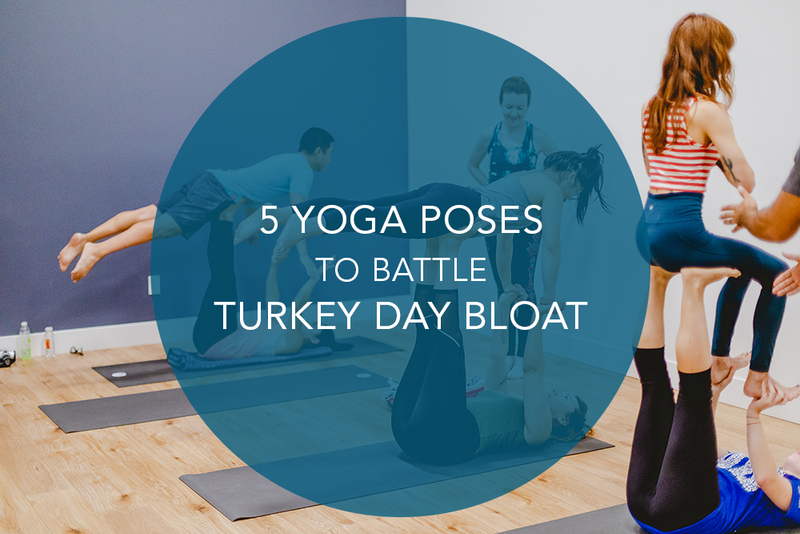 Which is why we turned to Sender One’s team of yogis for the best poses to squeeze in when your pants are feeling a bit tight (and before the tryptophan coma kicks in). As a bonus that’s not gastrointestinally inclined, 10 to 15 minutes of these quick stretches will also give you a moment to breathe and relax in the midst of the weekend’s joyful chaos. So after you indulge your taste buds, indulge your spirit with these rejuvenating moves. Aptly named, this Bikram pose stimulates the ascending, descending, and transverse colon, which aids digestion while relieving and preventing uncomfortable gas. Stretch it out in half or full pose, and your family members will thank you. Lie on your back. Bend one or both knees into your chest. Hug your knee(s) in tight and gently rock your knees from side to side as you breathe. Release the knees and slowly lower your legs to the floor. Rest a few seconds, then repeat two to more times. Too much stuffing got you feeling stuffed? A backward-bending asana will stretch out your stomach and ease the discomfort. Sit on your heels. Slowly lean back and placing your palms six to eight inches behind you, fingertips pointing away. Press your hands into the ground, lift your chest, and arch your back. Tip your head back to increase the stretch. Hold for five breaths, and then sit up. Digest and detox! With this pose you alternate between compressing and releasing the colon. As you do this, it stimulates the body to release waste and toxins. Stand at the top of your mat with your feet hip-width apart. Raise your arms out to the sides, palms facing down. Turn your left foot in 45-60° to the right and your right foot out 90°. Align the right heel with the left heel. Center your right knee over your right ankle. Turn your torso to the right, keeping your hips as square as possible, and lean forward over the front leg. Reach your left hand down–either inside or outside the foot–to the floor or to a yoga block (rest it against your inner right foot). Raise right hand up. Look forward (neutral) or up at your hand (more advanced). Hold pose for 30-60 seconds, exhale, and release the twist to return to a standing position. Repeat for the other side. Stretch out your stomach muscles with this stimulating asana that will get blood flowing through your entire body. Start in Downward Facing Dog. From there, lower your knees to the mat until you’re on your stomach. Bend your knees up, then reach back with your arms and grasp the outside edge of each ankle, one at a time. (Use a strap if you can’t reach your feet.) Point or flex your feet. Lift your feet up as you shift your weight forward so you’re resting on your navel. Hold for three to five deep breaths, then slowly release. This simple pose calms an upset stomach through a gentle side-to-side massage. Lie down on the floor and hug your knees to your chest. Drop your knees to the left, using your left hand to push them down gently. Turn your head and stretch your arm out to the right. Hold for five to ten breaths, then return your hands and knees to center. Repeat on the other side. Enjoy your yoga and your weekend! And, while you do your Black Friday shopping this weekend, don’t forget to check out Sender One’s deals happening through Sunday! Check out the Santa Ana deals here, and LAX deals here!